With this advanced technology, surgeons experience more control and precision; plus, LenSx features real-time diagnostic tools for an accurate visual of what’s going on inside the eye during the procedure. 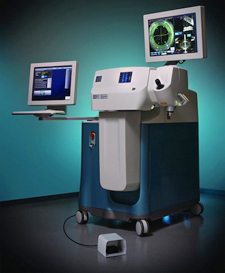 Click Here to Read the Article About Laser Cataract Surgery Published in My Suburban Life! 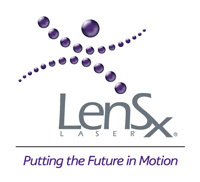 The LenSx laser automates the most challenging procedures in cataract surgery. It creates the highest level of precision available with a cool laser instead of a blade. LenSx automates the most challenging procedures in cataract surgery. It creates the highest level of precision available with a cool laser instead of a blade. Performed on an outpatient basis in our state-of-the-art facility, the procedure is generally quite comfortable. The LenSx laser replaces the need for hand-held blades during cataract surgery further improving accuracy, healing time and ultimately your visual results! The LenSx Laser uses the sophisticated technology called OCT (Ocular Coherence Tomography) to provide our cataract surgeons with an incredibly precise and detailed image of the inside of your eye. Then, your surgeon customizes the treatment plan for your eye and guides the LenSx laser to create small incisions on the cornea, incision of the anterior covering of the cataract, and then fragment the cataract. This makes it possible for our surgeon to remove the cataract more easily and safely and correct for astigmatism. Once the LenSx Laser has completed the incisions, the cataract is removed and an intraocular implant is placed in the eye for vision correction. Your Larson Eye Center cataract surgeon will discuss which intraocular lens is the best choice for you to correct for distance vision, near vision, or both. Click here to learn about your premium lens options. Many patients return to normal activities the day after cataract surgery. You can expect your vision to be crisper and clearer and for colors to be more vivid following your cataract surgery.